In McDonnell, the Federal District Court in Manhattan stripped UNUM of its discretionary authority to determine benefit eligibility. Discretionary authority was stripped because the Policy only granted discretionary authority to First UNUM, but the entity that decided McDonnell’s claim was UNUM Group (the parent corporation of First UNUM). The Court held that UNUM Group did not have discretionary authority because UNUM Group was not an agent of First UNUM and First UNUM did not delegate its authority to UNUM Group in a manner that satisfied the delegation requirements of ERISA. This is a landmark decision because it will affect most, if not all, cases insured by UNUM and several other insurance companies. UNUM has established centralized claim centers to determine the thousands of benefit claims brought by individuals insured by UNUM’s many insuring subsidiaries, such as First UNUM, UNUM Life, Provident, and National Life of Vermont, etc. The employees at these claim centers are employees of UNUM Group, not of the insuring subsidiaries. In an attempt to plug the gap—the fact that employees from a separate corporation were deciding the claims of the insuring subsidiaries—UNUM Group entered into a General Services Agreement (“GSA”) with each of the insuring subsidiaries. If UNUM is correct that it could, without satisfying ERISA, merely contract with an 'agent' to assume fiduciary duties in its stead, then UNUM could also delegate those duties to the lowest bidder (and the lowest bidder to an even lower bidder) . . . without even obtaining the consent of the Plan Sponsor [here, Morgan Stanley]. Such a system improperly writes §§ 402(a)(2), 402(b)(3), 402(c)(2) and 405(c)(1) out of ERISA. 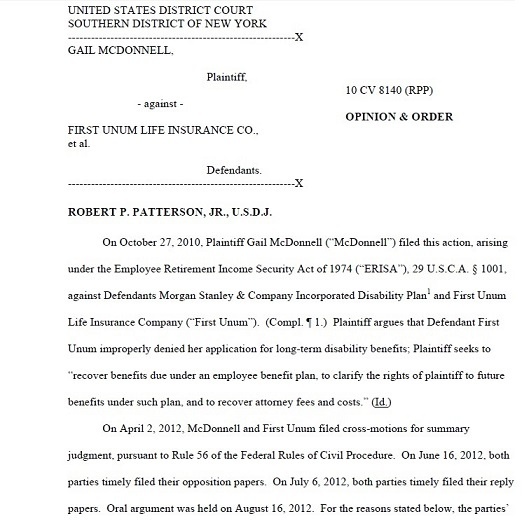 Since First Unum cited Section 7 of the GSA in the declaration it attached in support of its opposition brief, and during oral argument referenced the provisions of the GSA dealing with the relationship between First Unum and Unum Group, it strains credulity that the Defendant was not aware of the content of Sections 8, which appears on the same page of the GSA as Section 7. Given that Section 8 explicitly defines Unum Group employees as independent contractors and not agents of First Unum, Defendant’s agency argument is meritless. (citations omitted). If UNUM wants to correct this issue in the future, it is caught between a rock and a hard place. UNUM would either have to amend every one of its insuring subsidiary policies by delegating discretion to UNUM Group, or it would have to amend the GSA by removing Section 8. But, Section 8 as presently written served an important function. It preserved the corporate separation between First UNUM and UNUM Group. Without Section 8, First UNUM and UNUM Group would be liable for each other’s actions, thereby defeating the purpose of creating a separate corporation. The decision in McDonnell paves the way towards limiting the ability of insurers to apply the arbitrary and capricious standard, which functions against the interest of claimants and diminishes their rights in Federal Court.